Could an International Chat Platform Become one of The World’s Best Social Messaging Apps? It’s becoming more and more apparent that we’re entering a post-facebook world. Building time lines and looking back at what was happening this time last year is the nostalgic nature of a generation who likes posting memes about how kids today don’t recognize rotary phones. Naturally, the lucrative 18 -26 year old demographic still use facebook to communicate with their parents. A college kid might post some graduation pictures and a few select shots to keep her aunt and uncle current on what she’s up to out at State. But the party shots and inside jokes with friends are increasingly being sent over Snapchat and Whatsapp. The in-the-moment nature of the best social messaging apps is compelling – especially among younger people. The genuine desire for people to chat and share media with each other is undeniable, it’s human nature. But we don’t want nobody wants everyone to see everything. Even the extroverts bent on broadcasting their every moment globally on Instagram can appreciate the unique value of a personal message, and the exclusivity of being part of a closed group message. 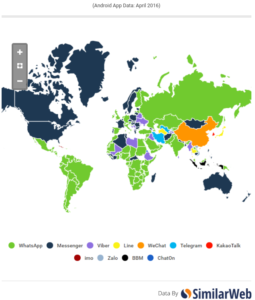 This map is courtesy SimilarWeb, who know that the most popular aren’t necessarily the best social messaging apps. Hello Pal has opened up a platform whose growth is meant to come from that same interpersonal appeal in those of us who are interested in other cultures. Learning a new language is appealing. Many of us want to do it in service of other goals. 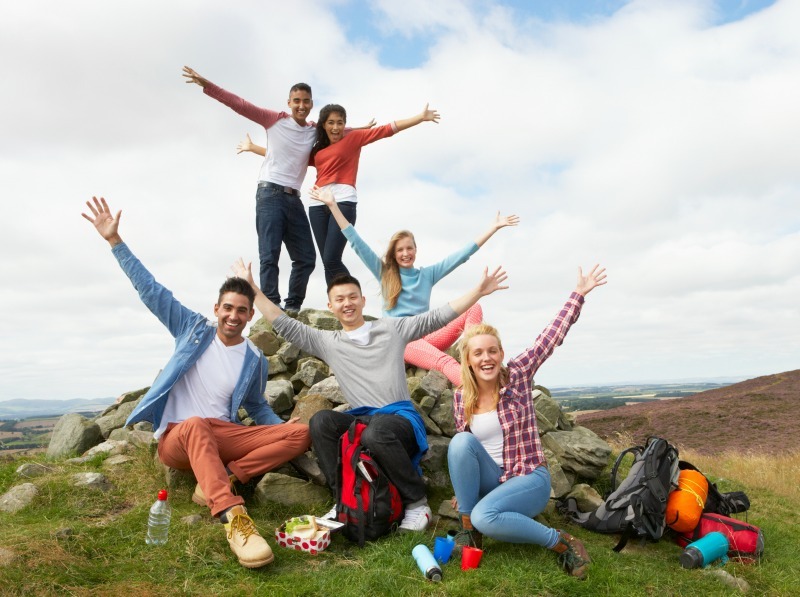 Young people, especially, often learn other languages in the process of overseas travel. What could be more exciting than going to visit Peru, or France or America? In 2016, despite tremendous success, most of the best social messaging apps remain stubbornly local. The big 3, WhatsApp, Messenger and Snapchat enjoy equal success in Europe and North American, but they’re illegal in China. That keeps them from catching on in auxiliary Asian markets. MOMO messaging has IPO’d to great value, and are showing strong growth in a Chinese market that one could expect to be saturated. Tencent’s very popular WeChat and rival QQ undoubtedly push more messages than MOMO in China. It would seem, though, that variety and unique connection methods are enough to get an app on phones, and it’s in users nature to keep social messaging apps around. Nobody likes to leave a fun party. The pervasiveness of Messenger, WeChat, MOMO and Wattsapp in their respective markets are impressive. The value of the enormous user-bases of the best social messaging apps is undeniable. But in a sort of Confucian paradox, the Messenger and WhatsApp user bases are there because of a stubborn pledge not to advertise or charge for the service. The Travel Industry is a $341 billion per year mega-business in the US alone, because people desperately want to do it. One of the first things that web 1.0 gave us was couch surfing culture, as people cut down on hotel costs by staying with friends they met online. Couchsurfing.com, Air BnB and VRBO have successfully commodified it to various degrees. The Hello Pal value proposition is a simple one. Given a way to communicate across culture and distance, users will find efficient, useful and fantastic ways to do what they’ve been desperately trying to do for all of history: they’ll communicate, get together, learn and grow, share ideas and make new friends. As they come together, they’ll create any number of opportunities for us to help them with travel, study, work news and other content. They will form groups and trace out usage patterns that allow us to better understand what they value in the platform, and how to improve on it in coming updates. The company is exploring multiple revenue verticals, all of which have been developed as a result of careful observation of our traffic. As this exciting organic growth phase continues, Hello Pal is looking forward to rolling out new features and product suites inspired by the continued enriching trans-cultural experiences of a truly global and diverse user base of one of the world’s best social messaging apps.